The Coeur d’Alene area is surrounded by dozens of lakes left behind by the glaciers of the ice age. There are more than 55 lakes within easy driving distance of Coeur d’Alene, but none more scenic and full of activities than Lake Coeur d’Alene itself. There’s something magical about Lake Coeur d’Alene that’s hard to define, but it begins with the spectacular North Idaho sunsets and moon rises, the plunge of an osprey after a fish, the glowing lights of downtown Coeur d’Alene reflecting across its waters at night. Coeur d’Alene ( i/ˈkɒr dəˈleɪn/ korr də-layn) is the largest city and county seat of Kootenai (/ˈkuːtniː/ koot-nee) County, Idaho, United States. It is the principal city of the Coeur d’Alene Metropolitan Statistical Area. Coeur d’Alene has the second largest metropolitan area in the state of Idaho. As of the 2010 census the population of Coeur d’Alene was 44,137. The city is located about 30 mi (48 km) east of the larger Spokane, Washington. After the 2010 Census the two metropolitan areas were merged into a single Combined Statistical Area with a population of 679,989. Coeur d’Alene is the largest city in northern Idaho Panhandle. The city is situated on the north shore of Lake Coeur d’Alene, 25-mile (40 km) in length. Locally, Coeur d’Alene is known as the “Lake City,” or simply called by its initials: “CDA”. 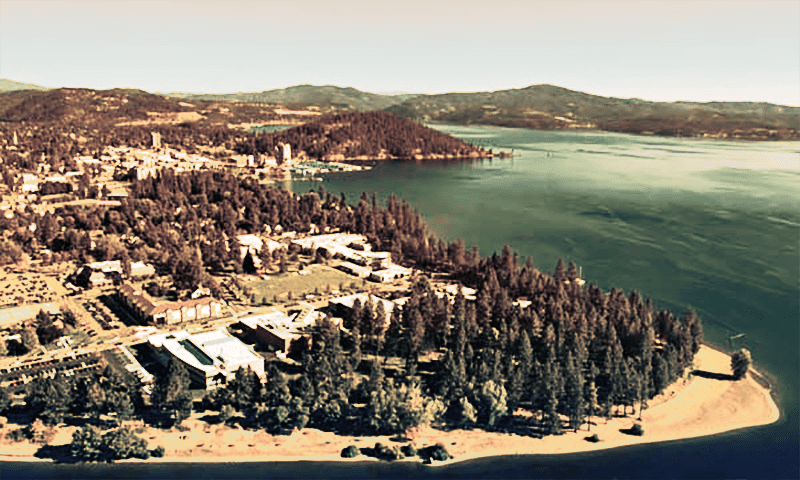 The city of Coeur d’Alene has grown significantly in recent years, in part because of a substantial increase in tourism, encouraged by several resorts in the area. Barbara Walters called the city “a little slice of Heaven” and included it in her list of most fascinating places to visit. On November 28, 2007, Good Morning America broadcast the city’s Christmas lighting ceremony because its display is among the largest in the United States. Coeur d’Alene is a resort town, with the Coeur d’Alene Resort taking up a prominent portion of the city’s downtown. It is also located near two major ski resorts, with Silver Mountain Resort to the east in Kellogg, and Schweitzer Mountain Ski Resort to the north in Sandpoint. The city is named after the Coeur d’Alene People, a tribe of Native Americans who live along the rivers and lakes of the region and were first encountered by French fur traders in the late 18th and early 19th century. The name Cœur d’Alène translated into English means Heart of an Awl, a reflection of the perception of the tribe’s traders as very tough businessmen.